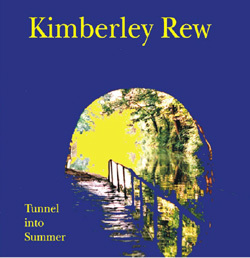 Kimberley Rew "Tunnel into Summer"
Hit songwriter and guitarist extraordinaire KIMBERLEY REW, a major force in pop/rock music for over 20 years, makes his solo recording debut with "Tunnel Into Summer" -- a CD that delivers more than its share of the catchy hooks and guitar wizardry that have become his trademarks. In addition to being a showcase for Rew, "Tunnel Into Summer" features guest appearances throughout most of the CD from ROBYN HITCHCOCK, GLENN TILBROOK, JULIAN DAWSON, DAVE MATTACKS, and ANDY METCALFE, who also produced half of the album's cuts. Rew began establishing a reputation playing with various groups in England in the early '70s. He first came to prominence, however, in The Soft Boys, which also featured Hitchcock. The critically-acclaimed group released a number of LPs and singles, most for the Armageddon label, before the members went their separate ways in the early '80s. Without missing a beat Rew became the guitarist/songwriter for the new group Katrina and the Waves. The group's high point came in 1985 when Rew's song "Walking On Sunshine" became a smash hit in the U.S. and around the world. As the group's popularity waned in the early '90s, Rew found himself contributing more to projects as a sideman, adding his master guitarwork to solo projects by Robyn Hitchcock, Julian Dawson, and others. Along the way, he also penned the hit "Going Down To Liverpool," for the Bangles, which appeared on their "All Over The Place" (1984) album, as well as their "Greatest Hits" CD (1990).